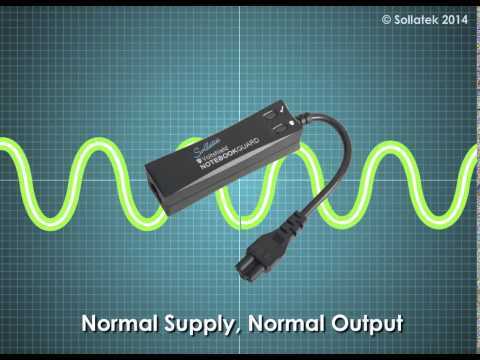 The NotebookGuard is a plug-in adaptor that prevents damage to equipment from high voltage levels of any duration. It works by disconnecting power when voltage levels exceed set parameters. Reconnection takes place when power returns inside parameters for a pre-set period. Fully automatic in operation. The NotebookGuard provides power-back surge protection as standard by its in-built start-up delay and voltage monitoring. Additionally, the NotebookGuard includes surge and spike protection. Protects against high voltage, and power-back surges. These conditions are harmful to electrical and electronic equipment and especially I.T equipment. This can cause loss of data, computer ‘freezes’ and permanent damage. By disconnecting the power when it is bad, the NotebookGuard safeguards against short term and long term damage to ensure higher efficiency from your appliances. Re-connects after a delay, thereby ensuring stability of the power supply and keeping your laptop battery fully charged. Indicators clearly display the status of the NotebookGuard. Available with both ‘figure 8’ and ‘cloverleaf’ connections. Compatible design to fit easily in your travel bag. Universal voltage for worldwide use. The most damaging power condition to laptops is sustained over voltage. Spikes & Surges are also a risk for Laptops and can cause catastrophic results by damaging the charger, main laptop or corrupting data.